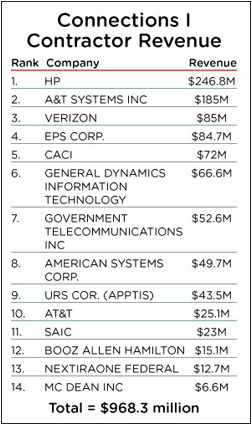 Many of the leading industry partners on the first Connections contract are also awardees on Connections II, including the top three revenue generators, Hewlett-Packard Co. (HP), A&T Systems, and Verizon Communications Inc. All returning contract holders express confidence that Connections II will be even more widely used than the first Connections contract, which was awarded in 2003. American Systems Corp. has nearly doubled its revenue each year for the past five years under Connections I, according to Byron Johns, Vice President of Governmentwide Acquisition Contract (GWAC) Business Development and Operations for the company. The small business has won nearly $50 million under the first Connections contract. “As a prime on Connections II, we will have the opportunity to continue supporting the priorities of our clients,” Johns said. Contractors are particularly enthusiastic about GSA’s commitment to educating federal agencies about Connections II, including the improvements that will make it more attractive to agency buyers. “The biggest challenge you have with a new contract is helping people understand what it can and can’t do, and how they can use the contract to complement the other GSA vehicles they are using,” said Susan Zeleniak, Group President of Verizon, which has won $83 million through the first Connections contract. Both Verizon and AT&T Corp. also see Connections II as an important vehicle for complementing their work on GSA’s Networx telecommunications services contract, on which they are both contract holders. “As the sister contract to Networx, Connections II allows us to offer an end-to-end solution to customers using our professional services and our traditional and advanced telecommunications services,” said Jeff Mohan, AT&T Corp.’s Government Solution’s Executive Director for GSA programs. AT&T has been awarded $25 million of work under the first Connections contract. GSA officials and contract holders said the Connections program has a good reputation among agency customers. Connections II Program Manager Debbie Clark recalls only one customer complaint during the eight years she has worked with the Connections program—and the complaint involved a billing issue, not contractor performance. More than 50 agencies have used the contract vehicle, and two-thirds of Connections I customers in the past several years have been repeat customers. “We don’t have any unhappy Connections customers. It works well for our customers and it works well for us,” said Don Small, President of Government Telecommunications Inc., which has won $53 million in task orders under the first Connections contract. The Connections II program office intends to do a lot more marketing of the contract through GSA and with its contract holders. “We will be working closely with our regional offices so they have Connections II in their toolkit, and working with our vendors so they have the tools they need to sell this effectively. And we will continue to be responsive to the needs of our customers,” Clark said.